A bird’s eye view of the Redondo Pier from the Redondo Beach Police Department’s drone program, taken on July 4. Photo courtesy RBPD. Sharp-eyed fireworks watchers may have noticed more than shells bursting in the air over the Redondo Beach waterfront on Independence Day. The Redondo Beach Police Department utilized a drone in the skies over the pier area on July 4. 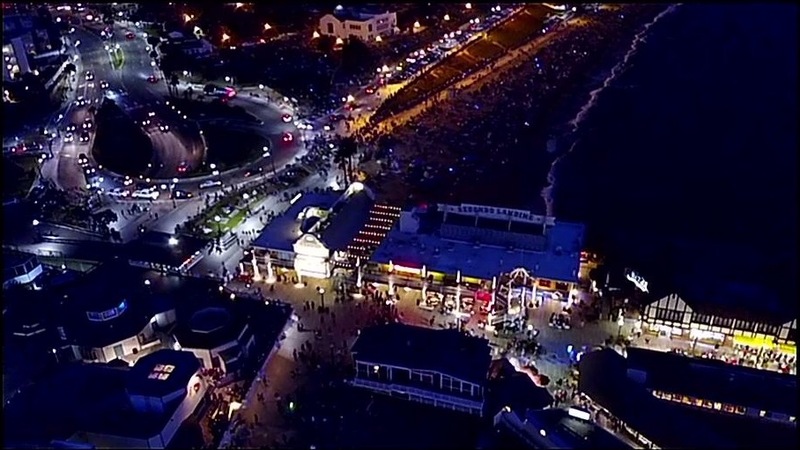 The drone provided an aerial view of revelers in the area and traffic flowing in and out of Redondo. More importantly to Redondo’s first responders, the drone provided overwatch in case of emergency. “It’s been pretty quiet tonight,” Barry Brennan said as one of his technicians guided a drone over traffic leaving the Redondo Pier parking structure following the evening’s fireworks show. Brennan, a longtime RBPD reserve officer, is the owner of Flying Lion Inc. Guided by an observation that there’s a hole in the law enforcement market for unmanned aerial vehicles, Brennan founded his company with the aim of providing drone piloting services, surveillance, and overwatch to first responders at their request. The city agreed to a $74,280 one-year contract, as well as a one-time payment, to retain the company’s services, at the April 4 City Council meeting. The drone program took center stage in March when a carjacking suspect barricaded himself in his car following a slow-speed chase. Brennan’s company provided aerial surveillance and was featured on local news broadcasts for its innovation. That, however, wasn’t the drone’s first flight; Brennan’s company, he said, has provided drone support “about 10 to 15 times” since Redondo’s Super Bowl 10K run, playing an eye in the sky, looking out for things officers might not see from street-level. Brennan’s control van, parked near RBPD’s Pier Substation, attracted plenty of eyes throughout the evening, as a big-screen TV showing a drone’s-eye view of the pier lit up the night. Overall, Brennan felt comfortable with the attention he and his company got throughout the night.